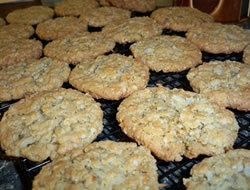 Sweet cookie rounds trimmed with coconut. 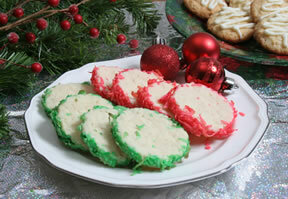 These colorful cookies will be a nice addition to your platter of holiday treats. Add the flour a 1/2 cup at a time, beating after each addition. Add 1 cup of the coconut and stir until evenly distributed. Separate the dough into two sections. Shape and form each section into an 8-inch long log. Place 1 cup of coconut into two small sealable plastic bags. Add the red food coloring to one bag and the green food coloring to the second bag. Shake and knead the coconut to coat it evenly with the food coloring. Spread the coconut out on separate sheets of wax paper and roll each log into one of the colored coconuts until the outside surface of the logs are completely covered. Wrap each coconut covered log in plastic wrap and place in the refrigerator. Keep refrigerated for one to two hours to allow the logs to firm up. Once the logs have firmed up, remove one from the refrigerator and cut into 1/4 inch slices. Place on a cookie sheet about 1 inch apart. Bake in an oven preheated to 325 degrees F. for approximately 14 minutes or until the bottoms are lightly browned. Remove and place on a cooling rack. Repeat baking instructions for the second log. 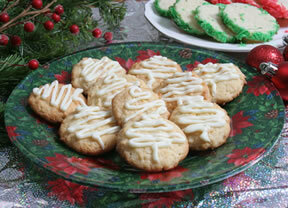 "I made these along with the White Chocolate Coconut Cookies for Christmas. I didn't care for these as much as the others. They didn't have as good a flavor as the others and they were a lot more work to make. Also, the coconut fell off the edges pretty easily. 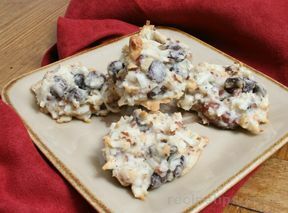 They did look pretty on the cookie try though."